The Magic Web and Other Stories is a collection of eighteen of Ashapurna Debi’s short stories on the lives of widows. One of the most prolific creative writers in Indian literature, Ashapurna Debi is known for her incisive chronicles of the Bengali middle-class. With women as her chosen subjects, her stories voice suppressed histories of intimate lives, and probe into the familial and social dynamics of relationships analysing the play of gender, caste and class. Through these stories, we are introduced to ritual-oriented drudges and gossip-mongering women, and to unbecoming women who refuse to hear the voice of everyday morality and silence the promptings of received values. One finds in them the rational, sensible, modern, urban gentleman all but merely the camouflaged victims of patriarchy. There are also tales where traces of deeply entrenched desires, expressed through gestures and silences, signify the buried yet pulsating emotions in the lives of women. Between conscience and custom, reason and prejudice, oppression and agency, these narratives show a rare sensitiveness to the deprivations and vulnerabilities, the triumphs and rebellion, the noise amidst the silences of the widow and her world. 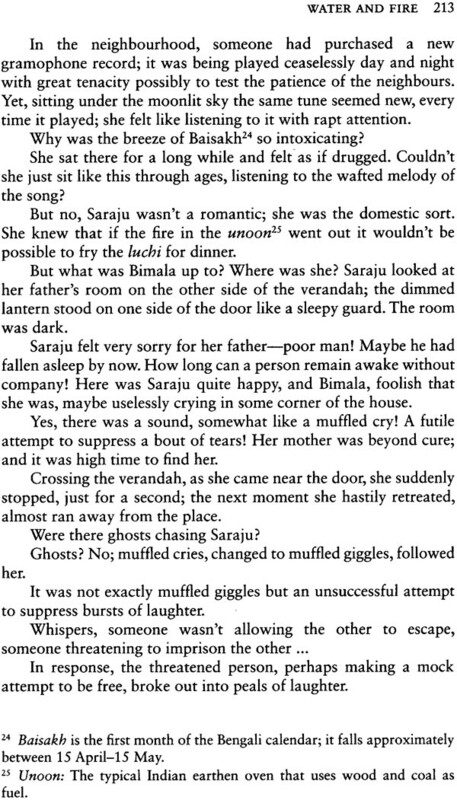 Jharna Sanyal masterfully retains this sensitiveness in a translation that is both confident and compassionate. 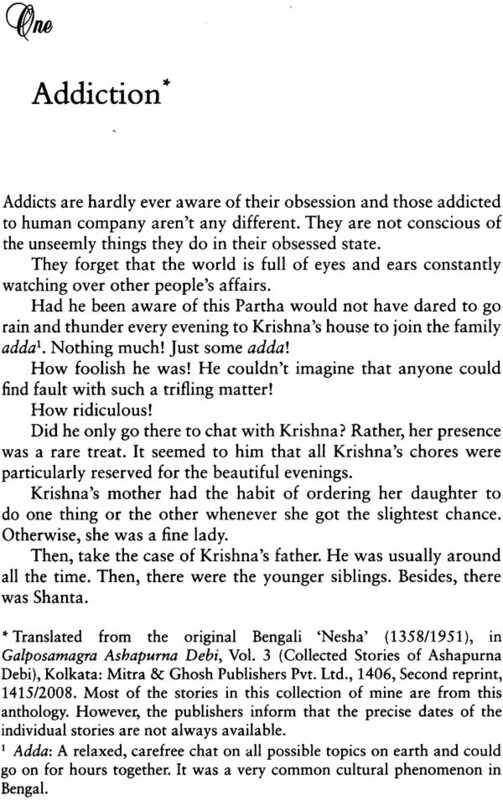 To those wishing to savour the richness of Ashapurna Debi’s writings, this is a gift! Ashapurna Debi was born in 1909 into a conservative, middle- class family in Calcutta. She did not have any access to formal education but encouraged by her mother, she learnt to read and write on her own and published her first poem in the children’s magazine Shishu Saathi. Even after her marriage at fifteen to Kalidas Gupta of Krishnanagar, her passion for literature, her indomitable will to write and the diligence with which she honed her talent remained unabated. She could not wait for a room of her own nor for an independent income to begin or continue with her writing and so she made writing a part of her everyday life. One of the most incisive chroniclers of our middle-class mentalities, her work includes more than two hundred novels and novelettes, about thirty-seven collections of short stories, and about sixty-seven books for children. Some works are yet to be published. Her contribution to Indian literature was acknowledged through the numerous awards she received, among them the Rabindra Puraskar in 1966, the Padma Shree in 1976, and the Bharatiya Jnanpith in 1977. She died in 1995. Jharna Sanyal is Professor of English, University of Calcutta. She has published articles on the interface between Bengal and Britain in the nineteenth and twentieth century. She has edited 19th Century Poetry and Prose: A Selection (Macmillan, 2002) and co-authored Narratives of Frailty: Saratchandra Chattopadhyay and the Colonial Encounter-An Alternative Mode of Hindu Self-fashioning (Dasgupta & Co., 2008). She has also translated Bengali short stories and essays for various anthologies and journals. 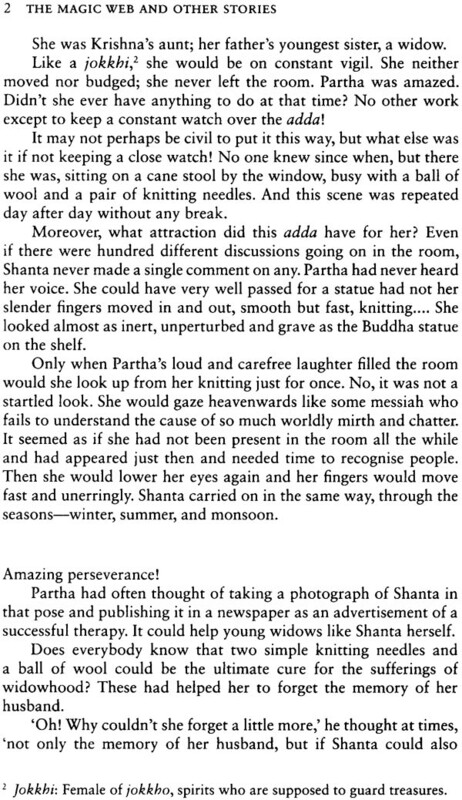 I do not hesitate to begin my introduction to Ashapurna Debi (1909-1995) with a pronouncement that might sound like a cliche: she is a phenomenon. 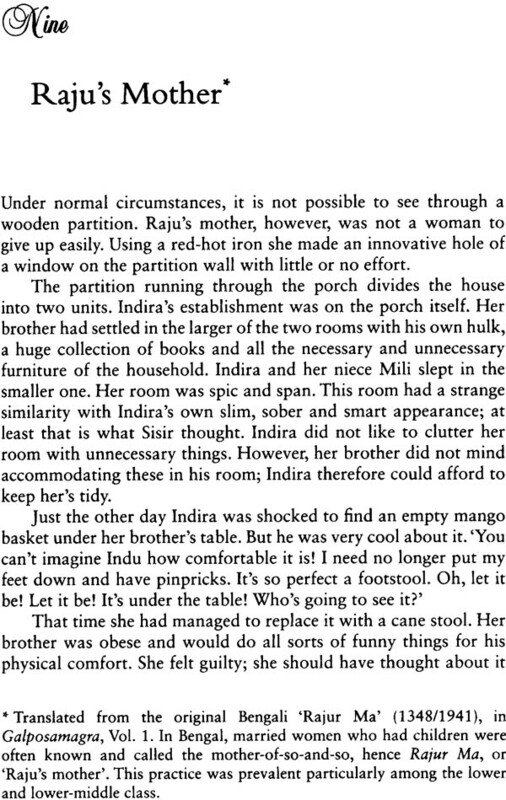 The sheer volume of her writing is rare and rarer is such a rich harvest on such a confined space-the middle-class Indian/Bengali family. Yet the variety, the overall consistent quality of the writing, the historical, social and existential questions embedded in her deceptively assuring narratives establish her as one of the most socially engaged writers not only in Indian but in World literature as well. She is the first historian of the Indian politics of domesticity and the emergence of women as questioning subjects. I have located her in the physical map in the Bengali middle- class family; but in the political map she is a citizen of the world narrativising the history of gender injustice, negotiating intimate issues of power and identity, scanning the authenticity of our social selves. The same interrogatory accents would be heard in the narratives of and about the subjugated women, in the writings from all over the world-in the writings of the once colonised nations, Africa, the Caribbeans, other parts of Asia, and of those from the colonising nations-from England (Virginia Woolf, 1882-1941), and France (Simon de Beauvoir, 1908-1986). None I believe took it up as an exclusive mission to interrogate society in relation to its attitudes towards women. The questions were mercilessly persistent but we were so seduced by the charm of her storytelling that they remained as rhetorical embellishments to the stories that can be neatly summarised without those imploding accents. Ashapurna Debi was undeniably one of the most prolific writers in Bengali literature. 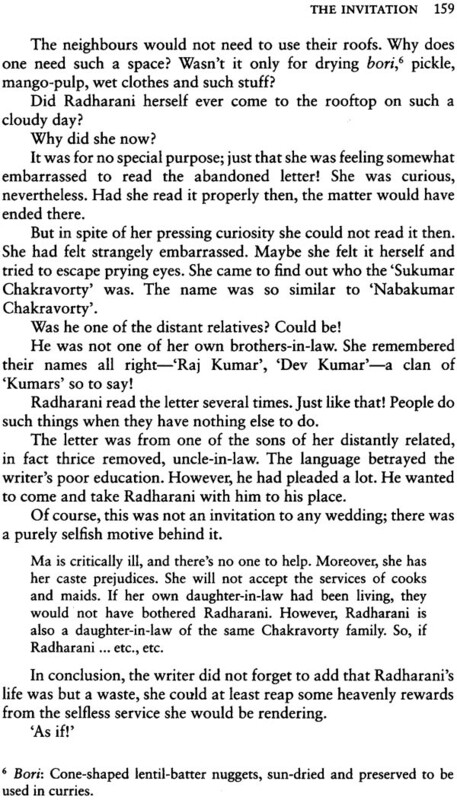 She preferred writing short stories to novels, and wrote about things she saw-’ja dekhi, tai likhi,’ she had said. 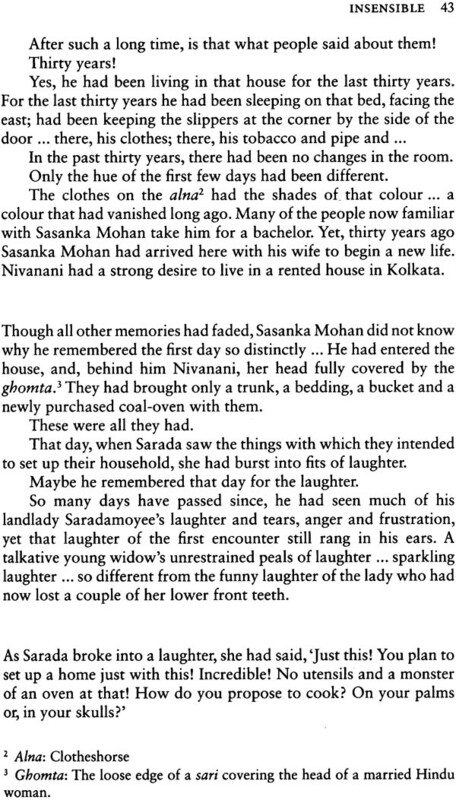 This candid admission authenticates the unimpeachable realism of her representation of the Bengali middle-class home and its periphery. Women and their environment were her chosen subjects and if any single category of women predominates in her work, it is the widow-a very familiar figure in Bengali joint families. Ashapurna Debi was generous in her contributions to journals and magazines, the well-known and the not so well-known - ones-I wonder whether she herself was aware of the total number of short stories she had written on the subject. No other Indian writer, I presume, has written so many on this single issue. I do not claim to have read all of them, but of the twenty or more I have, I translate eighteen in this anthology particularly for Indian readers who cannot read the original. The predominance of the issues and discourses centering on widowhood was a common Indian phenomenon in the nineteenth century. The Hindu widow is a prominent figure in the canonical texts of modern Indian literatures and was centre stage in national imagery. 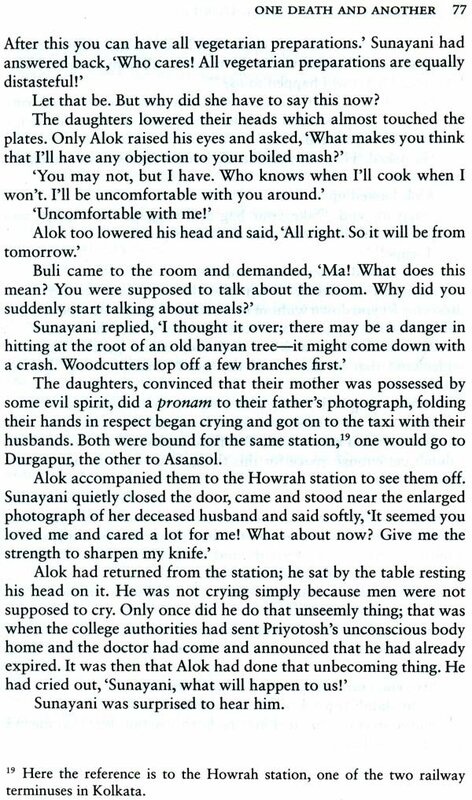 Placed against such literary traditions and discursive practices, Ashapurna’s stories stand out by virtue of their relentless investigation of the social, psychological processes and attitudes that naturalise and thereby legitimatise cultural, ritual and discursive practices of marginalisation of the widow. Her stories show a rare sensitiveness to the noise within silences and to silences in the noise of everyday transactions. They reconstruct the structures of familial/ interpersonal relationships within a patriarchal domestic economy to write an intimate account of ‘the silent side of history’ of middle- class mentality as exposed through the issues of widowhood. Ashapurna Debi’s stories probe into the familial and social dynamics of relationships to expose the myth of stereotypes. She narrates the suppressed histories of the lives of widows in Bengal and provides a glimpse into the mindset of the people who are a part of their lives. These stories have a particular interest for me-they bring in their trail the memories of much loved women who were part of my childhood days. Moreover, I am unabashedly an Ashapurna Debi admirer. I wanted to share these mundane, unpretentious, colloquially written but sharply perceptive narratives of our middle- class attitude towards a particular category of women. Born and brought up in a middle-class, undivided Hindu family, I, like many others, have lived with many widows in the family- grandmothers, aunts, and cousins-closely or distantly related to our family. And in the intricate hive of such families, how one was related did not matter-one was a member of the clan as long as one felt related. In my childhood, I, like everybody else, accepted widows of varying age groups as a ‘natural’ category like so many other categories in a family bound by their respective codes of conduct. I experienced the reality of widowhood when I witnessed the ritual of transformation for the first time. The eldest of my uncles was being treated in a hospital in Kolkata. My aunt, who was about thirty-five, and a mother of nine children, stayed back in Shillong along with the family. When the news of his death reached Shillong, and after the initial shock was absorbed, the rituals began. I was as if a stunned spectator witnessing a drama. I saw the way how all those things that made my aunt look bright and beautiful-her coloured sari, her ornaments, the big bright dot of sindoor on her forehead, the thick red line of sindoor on the parting of her hair-disappeared within an hour. She stood all in white. All the white saris (thhan as they are called in Bengali)’ of the widows, which I, until now, had accepted to be as natural as the dhoti men wore, seemed to be frighteningly white. At that time, what stunned me more was that my aunt would not eat fish anymore. She loved fish and had always - considered a vegetarian meal inedible-whatever might have been the quality of the food or the preparation. I could not believe that such a metamorphosis was possible overnight. She no longer ate with us at the dinner table, joined the vegetarian kitchen and ate with the others of her kind. 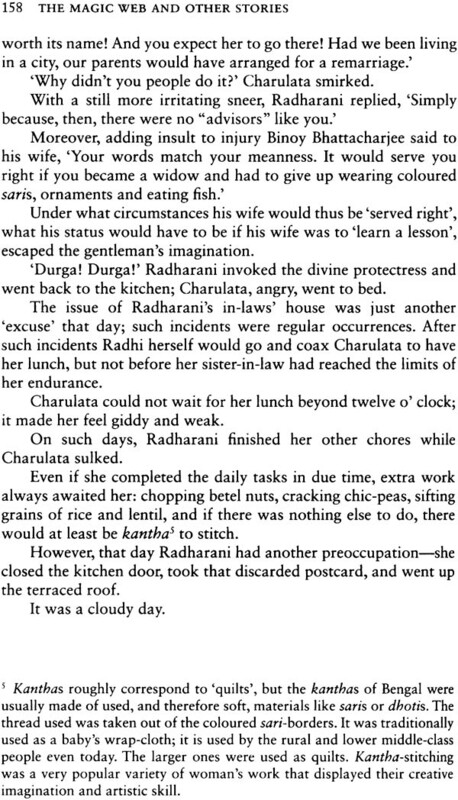 What was most baffling of all was that on ekadashi or the days of fortnightly fast, the shadhaba (a woman whose husband was alive) had to have fish while the bidhaba, or the widow, had to observe a day-long fast; comparatively liberal households would allow a sparse meal. Rice, the staple diet, was forbidden. My grandparents loved my aunt in a special way-as the wife of the eldest son of the family, she enjoyed a special status in the house. After her widowhood, they became doubly caring. However, when I was a child, it seemed strange to me how my grandmother could take fish while her beloved daughter-in-law could not. When I grew up, old enough to understand the complex interrelations among love, emotions, rituals, customs, habits, the individual and social psychology, my mother told me that my grandparents had repeatedly requested my aunt to remain a non-vegetarian. But she had sternly turned down their proposal. She thought that her children would not respect her if she violated the customs of a widow. No argument could dissuade her from her resolution. How strange all this seemed then! Another picture that still haunts me as if in a dream, is the one I painted in my mind after I had heard my mother explain why she was married so late (at 20!). From a very early age, my maternal grandfather had to go to Benaras once a year to remit the annual allowance for his young widowed aunts. When he would talk to his aunts, he could see clusters of young widows, their faces pressed against the window grills, gazing at them with melancholy eyes. Every year he renewed his vow not to get his own daughters married until they were graduates. I could almost see the faces pressed against the window grills. People often ask me, ‘Why these stories now? The widow’s lot has changed. We are in the twenty-first century.’ True, much has changed since the early nineteenth century. But in a vast country like ours, with its varied class, caste, gender divisions, an overall change in the average mindset is ambitious expectation. The considerable body of recent economic and sociological literature on the various issues of discrimination and deprivation of widows based on extensive surveys would tell us that though ‘the widow represents the vast majority of single adult women of India,’ widowhood is a neglected issue ‘partly because the experience of losing one’s spouse is overwhelmingly a woman’s experience.’ The widows’ endemic but quiet deprivations are not considered sensational enough to be media-worthy. Hence, the issues are kept out of sight and consequently, out of mind. What, however, popular films and novels offer for consumption is the conventional stereotype of the self-sacrificing ‘ideal widow’ or the jealous scheming ones. Such perpetuation and circulation of stereotypes in turn feed popular consciousness by both conceding to and creating popular expectation regarding the widow. Ashapurna Debi’s stories expose those areas of individual, gender and social psychology, transactions and negotiations that escape or elude surveys and statistics. In her introduction to the second part of the trilogy she shows her awareness of the inherent historical truth of fiction. ‘Sociologists write the history of the evolution of society, I have tried to sketch the same evolution through a story/narrative’(my translation). This is a strikingly ‘modern’ pronouncement. We merely have to look at modern/postmodern European culture historians and philosophers for the truth-claim of her assertion. Her stories on the widows present intimate histories of middle-class mentality. 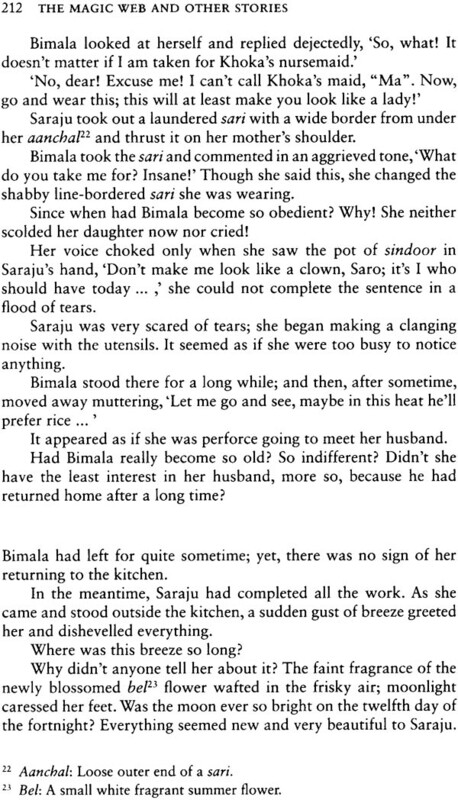 The irony inherent in her stories can best be appreciated if read in the context of the nineteenth-century reformers in Bengal and their discourses on the widow question. 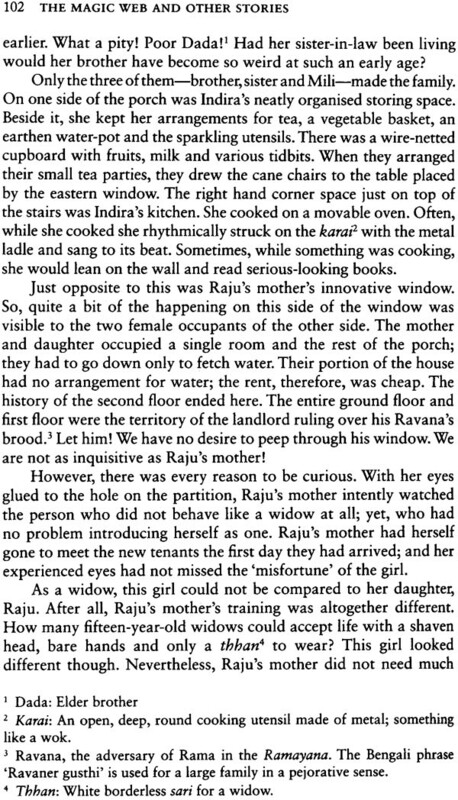 The life of a Hindu widow was one of deprivation of all possible kinds. She was hurled to a world without colours and laughter and had to submit herself to a complete transformation of her lifestyle. Her food, dress, and modes of social transactions would alter radically. The prohibitions intended to discipline her life reflect the hegemony of a male-dominated society. The patriarchal fear of the threatening, mysterious feminine Other led to the categorisation of women through the tropes of purity and pollution, into the goddess and the witch or the fallen woman. Through her observance of all the strictures imposed on her, in her almost inhuman self-control, or repression of natural desires, the widow was a ‘debi’ or, in her deviance or fall she was a witch or a fallen creature. Either way, she was beyond normal, social transactions-a marginalised figure of a special category. The strictures were politically fashioned, allegedly, to safeguard the widow against her vulnerability to sexual exploitation in a society that was not in a position to offer any constructive individual/social support in the absence of her proprietor, the husband. However, such strictures in most cases became chains to hold the widow to a life of misery, injustice and tyranny of customs. It was not a reformer but the father of a young widowed daughter who was the first to appeal publicly to the authorities of the shastras in favour of his young daughter’s remarriage. 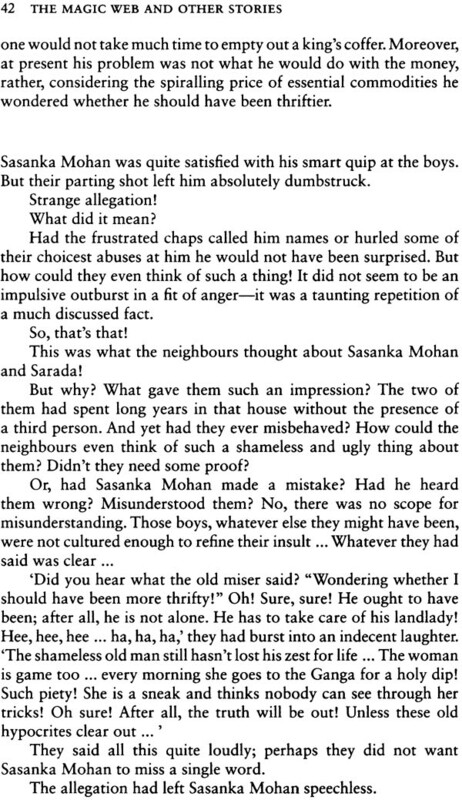 Babu Shyamacharan Das, a precursor of Pundit Iswarchandra Vidyasagar asked ‘whether the widowed daughter of a sudra who had not known her husband and who was unable to practice the virtue of concremation with her husband’s corpse or endurance of hardships of a life of widow hood could be married agreeably to the shastrasi? by Late Shilendra Biswas M.A.